Brief – Tessa Armelin is a Surrey architect with a growing reputation. New clients coming through reputation and referral. Providing details of her track record for them to find online is still valuable. 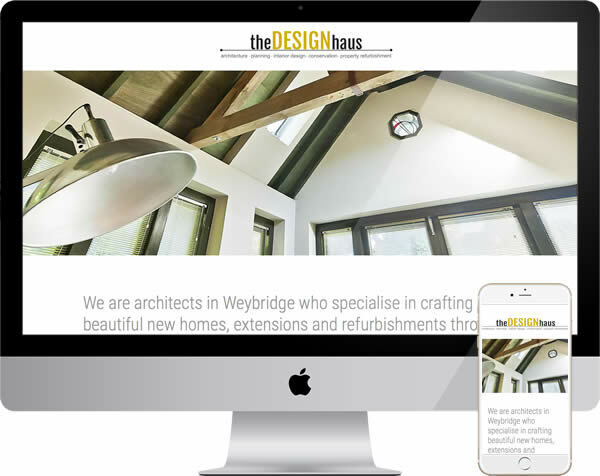 Tessa also recognised that a website would help The Design Haus reach a wider audience. Our client preferred to create a project focused website. With minimal navigation, to highlight areas of technical support and the standard of architectural work available. Technical & Search – Although the site would primarily be a portfolio, ensuring this worked on local search mattered. With the business in Weybridge, a wealthy, expanding area. One page websites can work in search but are rarely the best route. The joint decision was to create a home page which could visually function as a single page site, with additional options. There would be no traditional menu, simply image based links as users scrolled down. Ideal for those wishing to visit pages on services, or projects and a good compromise for search. Design & Build – Tessa worked to ensure images of past projects were available, which would be the core of a contemporary design. Visitors on any device could quickly gain an impression of the business, or contact them, just by scrolling down. Those wanting to see work in depth had an easy route to follow. This would again be image led and part of the design focus had to be ensuring an efficient technical framework. People would enjoy a visual display of work but not if pages took too long to open. Outcome – The Design Haus website met a positive reaction, from the owner, existing and new clients. Principle objectives in search were also met, with good local rankings. New, non referral business has followed. Largely due to the fine standard of work the business offers, their new website simply an essential conduit to the wider world. You are welcome to see more examples of our local and national work, or other options in our introduction to web design. If you would like to discuss your own web project, by all means get in touch.